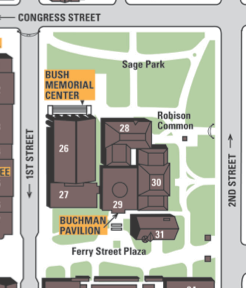 Conference registration will be held at the Buchman Pavilion, Keynotes will be at the Bush Memorial Hall. Below is information on transportation, parking, and lodgingZoom in and click icons for important location information. Local Busline: The CDTA offers an online trip-planner useful for figuring out how to get here by local bus. Additionally, the local bus can be used to navigate Troy and the surrounding Capital District without a personal vehicle. National Busline: The Greyhound and Trailways stops at the Trailways Greyhound Station in Albany NY. Megabus stops at the train station in Rensselaer, NY, and has direct routes from New York City and Ridgewood, NY. Both the Trailways Greyhound Station and the Rensselaer Train Station are on CDTA bus routes, which will take you to Troy. Amtrak has a scheduled train service into Rensselaer, NY. The Rensselaer Train Station is on the CDTA bus route, which will take you to Troy. A block of rooms is being reserved for the conference at a reduced rate. Check back here for details.